Sudden cardiac arrest (SCA) is a leading cause of death worldwide. Every five seconds, SCA claims a life leading to more than 6 million deaths every year. The vast majority of cardiac arrests happen in the home and almost 40% of these are witnessed by a bystander. After 1 minute, brain cells without oxygen begin to die. Emergency Medical Services (EMS) response times can average 7–12 minutes, or even longer. The ability of bystanders to perform CPR while waiting for the ambulance is critical to survival and positive patient outcomes. Bystander CPR rates vary greatly. In some places, only 5% of bystanders perform CPR and in other places as many as 70%. 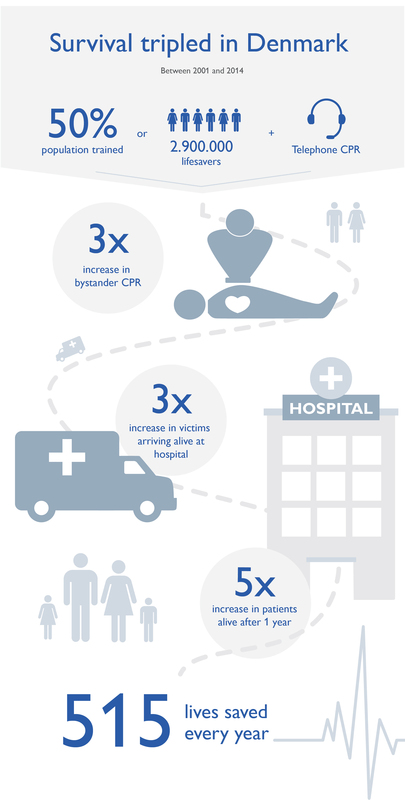 By increasing bystander CPR efforts, there is a large potential for increasing survival rates. It is essential for people in the community to act. The solution is widespread training of CPR throughout communities. Early recognition of a beginning cardiac arrest and knowing what to do next can dramatically improve patient outcomes and survival. Initiatives to train large numbers of community bystanders through schools or voluntary organisations have been successful in many countries including the United States, Norway, Sweden, Singapore, Korea, the United Kingdom, and Denmark. In the UK, there are over 30,000 cardiac arrests a year outside of hospital where the emergency medical services attempt to resuscitate the victim. However, survival rates are low - less than one in ten victims survive to be discharged from hospital . The British Heart Foundation has created the Nation of Lifesavers program aimed at improving survival rates for out of hospital cardiac arrest. Ensuring that all young people are taught CPR and PAD awareness at secondary schools is an integral part of the program. Alex learned CPR at school as part of the British Heart Foundations Nation of Lifesavers campaign. Several months later he collapsed, and CPR was performed on him in the school gym. The teachers' and staffs' fast actions and knowledge helped save his life. Denmark is one of several countries that have launched a national initiative to teach CPR. The program introduced mandatory training for elementary school students and those applying for driver’s licenses. Instructional training kits were distributed, dispatcher-assisted guidance was offered, and AEDs were installed in public places. "EMS is important to increase survival. However, the lesson learned recently is that the key to survival is engagement of the community." Laerdal, together with valued partners, works as a catalyst to help our customers implement programs that work. From America to Australia, from Denmark to Korea, the results speak for themselves. The American Heart Association (AHA) and the British Heart Foundation (BHF) have worked with Laerdal to implement wide-reaching programs to train schoolchildren and laypeople in their communities. In the United States, more than 2 million schoolchildren are trained in CPR every year. In Nowon, a district in Seoul, Korea a widespread bystander CPR training and Telephone CPR (T-CPR) initiative was implemented in 2011. Within three years, 40,000 people were trained and the number of survivors every year almost tripled. In Sweden, the number of cardiac arrest survivors increased from 156 in 1998 to 586 in 2015. This massive increase in survival corresponds with a large increase in bystander CPR now reaching 71%. The increase can also be attributed to the systematic training of almost 3 million people and the introduction of T-CPR. The ongoing Pan Asian Resuscitation Outcomes Study (PAROS) describes how community education programs with T-CPR, including cardiac arrest recognition and CPR with dispatcher assistance can improve survival rates. Community initiatives to increase CPR training as well as improve the quality of CPR delivered are critical to increasing survival. By implementing widespread programs to train CPR and providing frequent, high quality training that is systematically measured to guide performance, we can help save more lives, together.